The day before her soccer team’s season opener, Emily Kananoja laced up for the last time. It was a sunny August morning practice, and the Ryerson Rams women’s soccer team was doing one of their regular corner-kick drills. Her teammate headed the ball, and it came flying toward Kananoja’s head. Immediately, she felt pressure, shortly followed by an instant headache. “The whole right side of my head felt like my brain was almost gonna explode,” she said. She stumbled to the side of the field and found her team’s athletic therapist. Her teammates didn’t know she was out of the drill until it ended. By then, she was in the clubhouse, being tested for a concussion. That was Kananoja’s third concussion; it was the one that finally took her from the game she had been playing since she was three years old. Her first concussion was back in 2013. She had been playing for a club team in Manitoba. After her injury, Kananoja’s coaches pushed her back into the game. Not entirely sure what concussions were, and ignoring her strong headache, she went back on the field. She scored. After the game, her parents took her to a doctor, where she was diagnosed with a concussion. Now, looking back, the second-year sport media student regrets re-entering that game. She thinks having been educated about the signs and risks of concussions would have helped both her and her coaches recognize the danger of her symptoms, and the dangers of playing through the pain. At the beginning of March, Ontario became the first province in Canada to pass concussion legislation. The legislation, Rowan’s Law (Concussion Safety) is named after Rowan Stringer, who was 17 years old when she died after suffering multiple concussions while playing rugby in Ottawa. The law created stricter rules regarding athletes returning to both sports and school who have suffered concussions. Now, students need medical clearance if they hope to return to a sport following a concussion, which was not previously required in Ontario. Young people who have had concussions, like Kananoja, say the provisions in Rowan’s Law would have helped them in their recoveries. Other concussion advocates and doctors agree that although there are potential concerns its implementation in schools and sport organizations, Rowan’s Law is a big step in helping young athletes deal with this injury. Rowan’s Law is a “huge deal,” according to Ruth Wilcock, the executive director of the Ontario Brain Injury Association, who advocated for the legislation at Queen’s Park. The legislation was introduced late 2017. Wilcock said there are doctors on the sidelines in the NFL and other major sports leagues, but typically none available for school or community youth sports. This, she said, makes it more important that players, coaches and parents know the symptoms of concussions; they need to pull out players who exhibit these symptoms, and only allow them to return when they have medical clearance. “Usually what I find is that it’s a matter of ignorance, somebody not really knowing about the law or the risks of the injury,” said Dr. Gerard Gioia, a pediatric neurosurgeon and the director of the Safe Concussion Outcome Recovery & Education program at the Children’s National Health System in Washington, D.C.
Gioia was an advocate for Zackery Lystedt laws in the United States—concussion legislation which preceded Rowan’s Law. The law passed in Washington state in 2009 and, since then, every state has adopted a similar law. He said although some states have had this law for several years, many are still putting it into action. “How do we make sure that every school board, every youth sports league, is communicating this law and the information that people need to have, (and) training their people?” he said. Wilcock raised similar concerns. “That’s where the rubber meets the road so to speak, to make sure that the protocols in Rowan’s Law are being followed by the schools or by sports leagues,” she said. Rowan’s Law requires a yearly report detailing the process of the recommendations. “We’ve never put a checks and balance component into a piece of legislation like this,” said Catherine Fife, member of provincial parliament (MPP) for Kitchener-Waterloo and one of three MPPs who co-authored Rowan’s Law. She described the law as “the most powerful piece of legislation” she’s been part of in her six years at Queen’s Park. She said the social media responses have also been positive. In person, grandmothers have approached her at the hockey rink to express their happiness about the legislation. Jaime Hills was knocked to the floor while taking a charge from an opposing player at the Ryerson women’s basketball annual tournament. She was immediately given a concussion test and stopped playing the remainder of the games. Although she had never been diagnosed with a concussion, she recognized the feeling in her head, leading her to believe she had unknowingly suffered similar injuries in the past. She started to watch her team play, but then decided she couldn’t stay inside the court. The changing soundtrack—silence, squeaking shoes, the blaring buzzer, loud music and erratic whistles—was too overwhelming for her. 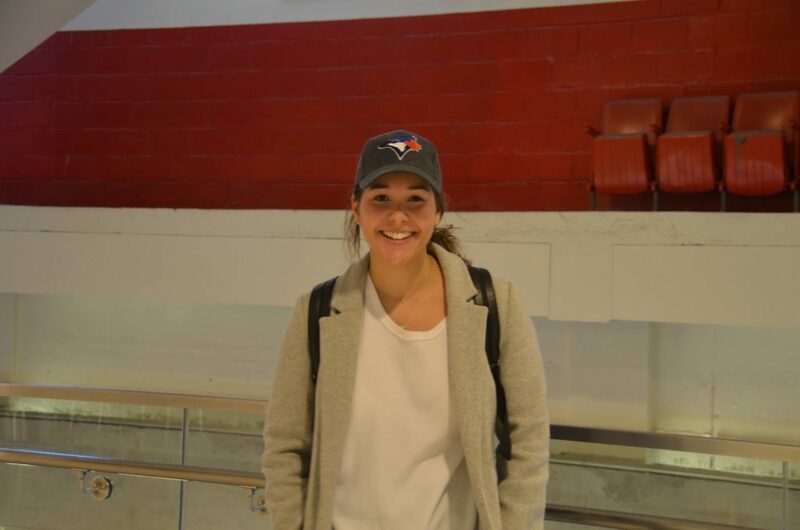 That was in November 2016, but Hills, a third-year sport media student, still feels the lasting impacts of that injury. In class, sometimes she can’t process what her professors are saying; she tries to listen and pay attention, but she can’t process their words. Immediately after her concussion, returning to her media-based program was difficult because of classes like TV lab, where she had to focus on one shot, over and over. That’s where the education aspect of Rowan’s Law is important—because of Stringer’s death, more people are talking about concussions. But the passing of Rowan’s Law is a bittersweet victory; its creation was sparked by a death. After Kananoja’s concussion in August, she remained involved with her team by managing their social media. She live-tweeted games and went on some away trips. Now, the season is over, and she’s taken an even bigger step away from soccer. At first, she was fine with that arrangement, but she said it’s harder to see her teammates play now. 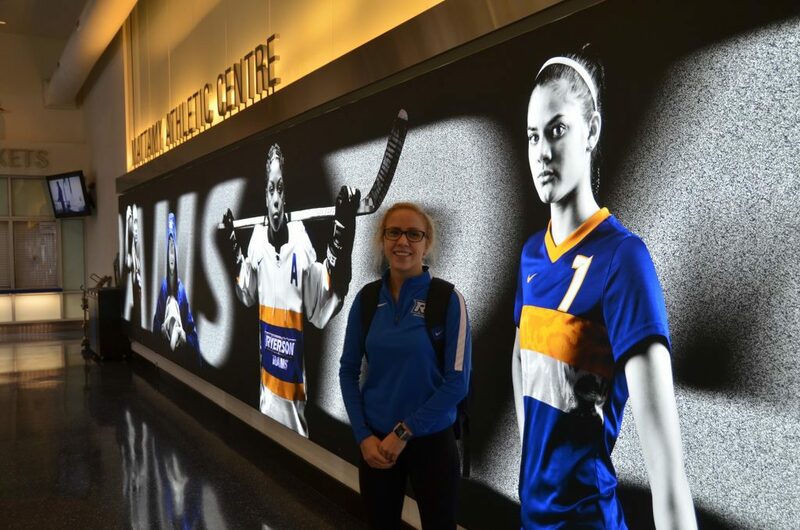 On a frigid March afternoon, Emily Kananoja sits in the Rams Café in Ryerson’s Mattamy Athletic Centre. A glass wall separates her from the gym, where her team is working out in the weight room. Blond hair tied back, wearing black leggings and a royal blue Ryerson athletics jacket, she looks ready to participate. Her black-rimmed glasses—which, post-concussion, she must wear often because her eyes have trouble focusing—sit on the white table. They’re a reminder of the reason she is not in the weight room with her team.